You want your sugar glider to be happy and healthy so you should provide him with the best possible home. A great home is safe, secure, and has plenty of room to eat, sleep, and exercise. Sugar gliders need room to climb so the cage should be as large as possible. For one glider the cage should be at least 20″ x 20″ x 30″. Since sugar gliders like to climb and prefer their food to be placed high up, a tall cage is best. With your pet’s home, bigger is always better, so go with the largest cage possible. The cage should use wire mesh or metal bars. Tall bird cages often make excellent homes. The cage needs to be in an area that is away from human traffic during the day so your pet can sleep. The cage should be in an area that gets enough light to distinguish between night and day, but avoid direct sunlight. Being nocturnal, your sugar glider will need a nesting box to sleep in during the day. The nesting box can be a cloth pouch with a slit in front and attached to the side of the cage, a wooden birdhouse, or even a plastic hamster house. Wood shavings, shredded plain paper, or bedding made from recycled paper can be used on the floor of the cage and will help to absorb urine, droppings, and dropped fruit. There are many suitable commercial beddings available. Whichever substrate you choose should be non-toxic, in case your pet eats it, and good at absorbing waste. Heavy flat bottom dishes or dishes that attach to the sides of the cage are best for food and water. Sugar gliders like to eat up high so containers that attach to the side of the cage often work best. A stoppered water bottle that attaches to the cage is an excellent choice for water. Sugar Gliders love to climb, so climbing branches should be provided in the cage area. Make sure you use non-toxic wood. When your pet strips the bark on the branches or the branches become soiled replace them with fresh branches. 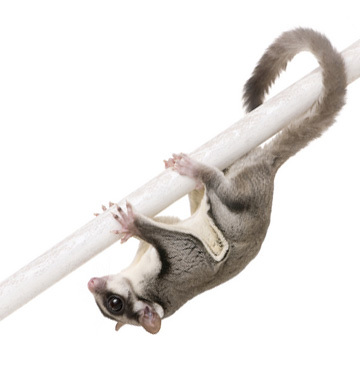 Sugar Gliders like to play and will enjoy bird toys, ladders, chew toys, tunnels, and bells. Solid exercise wheels and run about balls can also be exciting toys for your pet sugar glider.